What defines an elite credit card? Is it the airline fee allowances, such as what American Express offers with its Blue Sky Preferred travel card? Maybe it’s the around the clock concierge? Whatever you define as elite status, there’s one credit card company that’s perfected it. 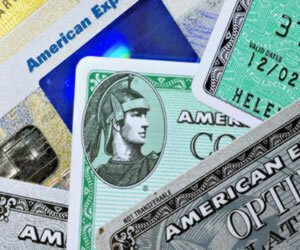 American Express has long since been synonymous with elite status. While the card network has expanded its customer base in recent years, it still reins supreme in great offers for those with exceptional credit and the incomes to support a more refined life style. Sign up bonuses and rewards points aren’t the only reasons to consider American Express. It has loyal customers for a good reason: the exceptional customer service team. Here are several of its offers that require a flawless credit rating and a higher income bracket. This is a fine choice of how well American Express does elite. There are many perks, including bonus miles that allow you to earn 30,000 bonus miles toward Award Travel simply by spending $500 on the card within the first three months of membership. Every time you use your card, you’ll earn double miles on your purchases and one point for every dollar spent on other purchases. If you’re a traveler, you’ll appreciate the first bag checked free inclusion – and this applies for up to nine people who are part of your reservation. That’s a $50 savings for everyone in your party for round trips on Delta flights. The $95 annual fee is waived the first year and the travel perks that are part of this offer more than make up for that fee. A few of them include priority boarding and 20% savings for your in flights that can be used towards meals, movies and beverages. Looking for a no annual fee card? The Amex Blue Sky just might be what you’re looking for. This offer includes 7,500 bonus points just for spending $1000 during your first three months of membership. This equates to a statement credit of $100 – and then you’ll earn one point for every dollar spent on the Blue Sky. And you’ll love the flexibility that’s part of this offer, including unlimited travel rewards and choices with never a blackout date nor any kind of travel restrictions on any airline. Car rentals and hotels are including on that restriction-free aspect, too. One thing many card members like is the flexibility in payments, too. Unlike the class American Express, you can take advantage of spreading your payments, which is more like a traditional credit card. Your Blue Savings includes discounts at a seemingly endless list of restaurants, hotels and your favorite retailers. Finally, enjoy twelve months interest free on all your purchases. This all equates to what’s become one of American Express’ most popular and sought after cards. Excellent credit earns approval. Business owners have long since come to rely on American Express as they grow their businesses. With so many features and functions built into the business credit cards, it’s little wonder small and medium size business turn to this card network. One reason this is such a strong offer is the versatility in its rewards. You can take advantage of gas, airline or travel rewards. It’s truly adaptable for your business needs. You’ll earn a point for your business with every dollar spent. Your rewards never expire and there are no blackout dates. Not only that, but your first purchase earns you 10,000 True Blue points. Enjoy automatic discounts through the OPEN Savings program and ordering additional cards for employees is a breeze. This choice helps you grow your business, but there are a host of safety features built into this offer so that you can also protect your business, including emergency card and cash replacement, purchase protection, extended warranties, car rental loss, damage insurance and even legal and medical referral services. Plus, you’ll travel easier knowing you’re covered with $100,000 travel accident insurance. Identity theft is a growing problem, but with the Amex card family, you’ll always find a willing team to help you as you cover the bases. Business Gold Rewards Card from American Express also includes the OPEN network. It’s a consistent high ranking product from Amex, partly because of its triple points earned on airfare, double points for advertising (here in the U.S.), gas stations and all of your shipping needs. All other purchases earn you one point per dollar spent. Not only that, but there are 500 partner retailers who participate in the program, making it a great way to cut costs on all of your shopping. Around the clock support, a bonus 50,000 Membership Rewards points when you spend $5,000 in your first 90 days of membership are also strong reasons for business owners to consider this elite choice. And speaking of that – excellent credit is needed for approval. There is $175 annual fee, however, it’s waived your first year. Finally, enjoy additional gold cards for $50 a year – ideal for those employees who need access to your credit card and the first year is waived on these cards, too. Many business owners like the idea of combining debt into one account – and the Gold Amex is the ideal choice for many company owners. Finally, with so many smartphones in service today (one report says half of every new phone sold in the U.S. is a smartphone), American Express offers full repairs to damage or problems – even if your carrier’s warranty has already expired. Usually, it covers up to $1,000 in repairs and if it can’t be repaired, you can use it to replace it. You’ll want to carefully review the terms and conditions since there are guidelines. Are you an American Express card member? If so, let us know your favorite features of your chosen card and what it is about the network that keeps you a loyal customer. Visit our Facebook page, follow us on Twitter or leave us a comment below.